The Ramblers’ Association, now called simply "The Ramblers" (after an AGM decision in 2008) is the largest charitable institution in Britain, concerned with walking issues and works to promote walking and to improve conditions for walkers. It has a combined membership of over 143000 in England, Scotland and Wales and has been active for over 70 years. 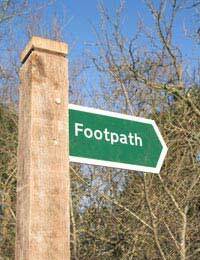 Its main responsibility is the protection of public footpaths and to campaign for public access and right of way to the countryside. It safeguards Britain’s network of public paths and works with local authorities to ensure that footpaths are not blocked or overgrown and that they are kept free from obstruction. It is also involved with protecting the countryside and other green belt land from pollution and from building developments that are not in keeping with the natural environment so that walkers have a beautiful, tranquil setting in which to walk. It also has a role in educating the public about their rights and responsibilities in the countryside and it promotes the health and environmental benefits of walking to people of all ages, backgrounds and abilities encouraging them to take more regular walking trips to improve their fitness and in the fight against obesity. The Ramblers are constantly at the forefront of campaigns to increase accessibility to Britain’s footpaths, be that carrying out path surveys, extending the path network, appearing at public enquiries and defending walkers’ rights in cases of routes which are scheduled to be diverted or even closed altogether. It’s not only the traditional countryside routes that they have an interest in, they are also keen to campaign for access to coastal areas, including sea banks, estuaries, cliffs and beaches. There is almost certainly an official ‘Ramblers Club’ located near to where you live which is affiliated to The Ramblers. You’ll often see them mentioned within the community pages of your local newspaper detailing walks that club members have been on recently and a contact name and number if you also want to get involved. Depending on the number of members a club has, you may get 3 or 4 different groups from the same club walking different routes on the same weekend, according to their level of ability. Walks can be in the region of 10 to 15 miles for the most experienced and may sometimes involve trickier environments including hill ascents whilst novice groups may simply walk for 3 or 4 miles on mostly flat terrain. The factors to consider when putting a walk together is to look at how many members wish to take part, the difficulty of the ‘course’ or terrain such as how many stiles walkers have to negotiate and how hilly the walk is but you’ll be placed into a group of walkers of a similar standard to you, so whether you’re an experienced walker or a complete beginner, there’s bound to be a walk that’s suitable for you. Each walk will have a trip leader and you can take it in turns to be the trip leader where, not only will you have to plan a route but you’ll actually get to go and walk it in advance of the walking party a day or so before the walk takes place in case any features of the walk have changed as it’s important for ‘ramblers’ to know what they’re likely to encounter. You should contact your local Ramblers’ Club to find out more. It’s a great way to learn all about walking and to make new friends at the same time.